As I walked our dog Luka and his cousin Punky (my sister's dog who is staying with us for the week) on this stunningly beautiful spring morning through the Smoke Bluffs, my thoughts were, naturally, on Sunday's Vancouver marathon. It seems like a long time ago since I last ran a 42.195km race, I thought, before realizing that is because it has been more than a year. Since 2005, I'd adopted the habit of racing two marathons a year. But in 2010, I did the Rotterdam marathon in April - and haven't run one since. Having run a 50-miler in August 2010 and a 100km in November 2010, it hadn't really felt like a long marathon break. But as I feel my excitement building these last few days before the Vancouver marathon, I am reminded of how much I love this particular distance. It also makes me realize how much I've missed running one in the past 12 months. It may have felt like a habit I'd gotten into, and needed a break from, and perhaps that is exactly why I am so much looking forward to Sunday's race. I'm glad to experience the joy of anticipation and am taking good care to hold on to it. You don't want to be overexcited but you do want to enjoy that sense of exhilaration and of looking forward to doing something you love to do. This is it, you've trained hard, you know what pace you're going to start at, you've got your clothing, shoes and nutrition ready, have planned to collect or already picked up your race package, and organized your race morning travel plan. Now it's very important to put yourself into the right frame of mind for race day. One of my training partners from the Squamish Titans Tuesday Runs mentioned he had a horrible Vancouver half marathon last year, and he believes it was mostly due to his mindset. He is in a much better place this year, both physically and mentally, and is excited to have a very different day this time around. On race day, there will be many things we cannot control but we remain in charge of the most crucial one: our frame of mind. It's up to ourselves to arrive on the start line with a positive mindset, determination to give the best we have on the day, and to keep smiling when things get tough. If you've never tried flashing a smile in the final third of a marathon, give it a try on Sunday - I guarantee you will get a boost of energy from it. Remind yourself to relax, to stay in the moment and to enjoy. Yes, it will be a challenge but that's the reason we choose to accept it in the first place. In July 2003, I ran my third marathon at the Gold Coast in Australia. By then I'd been training and racing as a triathlete and completed two Ironmans which finish with a 42.2km run. The fastest I'd covered the marathon distance was as part of an Ironman, in 4:11. I was training more consistently under the guidance of a coach, had more race experience, so physically I'd improved since finishing the Sydney marathon two years earlier in 4:44. In the weeks before my third marathon, I began reading Running Within: A Guide to Mastering the Body-Mind-Spirit Connection for Ultimate Training and Racing by Jerry Lynch and Warren Scott. Reading that book helped me better understand the mental approach to endurance racing. It explains the direct relationship between our mental dialogue and performance, recommending you use positive affirmations. The 2003 Gold Coast marathon was the first race in which I used a cue from Running Within, Relax and Achieve the Max, as a reminder to be calm and release any tension. “Learn to use a cue word during your performance as a stimulus for the relaxed state ... This will reinforce the connection between what your mind is saying to you and what your body is doing. 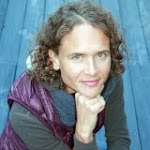 As you say the cue word, feel the stillness spread throughout your body,” Lynch and Scott write. I ran that marathon in 3:24, an improvement of 47 minutes. No doubt my big PB was a result of my improved physical fitness but it was also due to gaining an understanding of how to train and use my mind. As endurance athletes it's important to learn to do that. End of A Hundred Reasons to Run 100km excerpt. Before almost every marathon since, I read a few pages of Scott and Lynch's book. On Sunday again, I will use the cue Relax and Achieve the Max at some point in the race. Another I liked, and used in the Vancouver Sun Run two weeks ago, is the mental image of pushing a treadmill band with your feet - this image, used to remind athletes to use their energy to go forward rather than into the ground by slapping feet hard on the pavement, was mentioned by the inspiring and knowledgeable Kristine Chambers on the TriBC Triathlon Community Coaching clinic I did last month in Whistler. I'll likely use this image again on Sunday. "Through evolution, our species developed an instinctual tendency to run harder when chasing or fleeing something outside ourselves, a tendency that remains with us, because while our environment has changed sigificantly since the birth of mankind, our DNA has changed little. So today we can, if we choose, manipulate this instinct to make a game of running faster by consciously trying to run faster against the clock." Use your mind, and use it wisely, on race day - it's a crucial tool in the marathon! With four days to go until the Vancouver marathon, you should decide on your race pace if you haven't done so already. It's important for any distance but especially so for the marathon, a race where starting too fast will cost you dearly in the second half. It's hard to contain your excitement at the beginning of a race that has been your goal for at least four months. That taper has left you rested and that, combined with the energy of your fellow runners, makes it easy to head out too quickly. This is where race pace planning is very helpful, as it focuses your mind and body on preserving your energy in the first half so that you leave enough in the tank to cover the second half at a similar pace. As tempting as it is to tick off those first kilometres and miles a few seconds ahead of your goal pace, try to avoid it because it usually catches up with you somewhere around 28km or so. The seconds you save by running the first half a few seconds per kilometre faster are easily lost when you find yourself walking later. Typically you begin your preparations for a specific marathon with a key goal in mind. If it is your first, finishing is likely your key target. If you've done one before, and have prepared accordingly, you'll likely aim to improve on your previous time. This will be my 13th certified and standalone marathon (I qualify this as I've run five marathons as part of an Ironman; did what was supposed to be a marathon distance in Death Valley in 1999, though was cut short by 3km because of a sand storm; and have done four ultras, i.e. races that exceed the 42.195km distance - these all provided helpful experience and lessons for running a marathon). Based on my race times this year - 89:46 for a half in February, between 19:30 and 19:42 for four 5km time trials in the past four months; and a 40:09 10km time two weeks ago - I have decided to aim for a marathon PB which means anything faster than 3:07:10. I also ran 10 Yasso 800s at the end of March, finishing them between 3:11 (for the second) and 2:54 (for the last). Read more about Yassos and my marathon race pace considerations here. On Sunday, I will aim to run 4:25 per km or 7:06 per mile (tip: make sure you get your race pace in both km and mile units). A very handy tool is Merv's Running Calculator. I will also aim to do the second half slightly faster than the first. I ran my PB in the 2008 Victoria marathon (here's a race report including splits). However, I also keep in mind that I've run a 3:12 and 3:10 on the Vancouver course in 2008 and 2009, when I expected to be a little faster (my 2008 Vancouver marathon race report). Overall, my key goal is to have a great race - by that I mean that I am going to make each step the best it could possible be while reminding myself how much I love running marathons. The result will be, well, exactly that - the result. I am very much looking forward to Sunday. 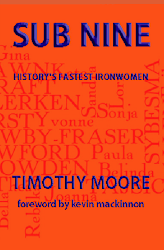 Sub Nine: History's Fastest Ironwomen by Timothy Moore is a book about the 22 women who have finished an Ironman in less than nine hours. Foreword by Ironman.com managing editor Kevin Mackinnon. Check out the current issue of Ultrarunning World magazine. It includes a piece on my fifth book, A Hundred Reasons to Run 100km on page 21. On Wednesday I tuned in to a conference call with Jack Canfield one of the editors of my book A Hundred Reasons to Run 100km had pointed out to me. The creator of the Chicken Soup for the Soul series, Canfield was set to speak for more than hour on the topic "How To Get To Where You Want To Be As An Author/Speaker". He was interviewed by Steve Harrison. Canfield has sold more than 115 million books in 41 countries, not bad after his first manuscript was rejected by 144 publishers. He's now a sought-after speaker and the conference call was well worth listening to. Much of the advice he shared applies to other goals than just becoming a successful author or speaker. As Canfield pointed out, there are various measures of success and you decide your own. Canfield's journey began when he was a teacher and found his class completely unmotivated to learn, with poor marks as a result. He researched ways to encourage them and his newfound teaching techniques made such a difference to his pupils' motivation and self-esteem, and their grades, that he was soon asked to explain them to his fellow teachers. And it wasn't long before he became a teacher of teachers. - Unless you let people know about your book, no one is going to buy it. - We make our own luck. We attract luck. Canfield's wife calls it synchromystical. - Think differently and visualize. - You have to believe that the work you are doing is extremely valuable. You deprive others by not telling them about your book (work). - I have a solution to a problem you have, even if it is "just entertainment". - If you want to be successful you have to do the work. 1. Decide that .. you deserve to succeed, you deserve to feel satisfied and you deserve to be supersuccesful. 2. Expect ... to succeed. 3. Visualize ... yourself achieving what you want. Canfield said he has 10 to 15 images that he visualizes each morning for a total of about 8-9 minutes. 4. Dream ... BIG. Dreaming big takes as much time as dreaming small. 5. Act. Get into action—do it now. People have good ideas all the time, you must start acting on them. Canfield has created a screensaver with all his goals. When you begin to believe, you subconsciously start looking for and seeing solutions. 6. Affirm ... your goals. 1. Be a Giver, rather than a Taker, especially when it comes to speaking: "If you are not willing to give it away for free, you are not passionate." 2. Authorship (if you want to sell books) is 10% writing, 90% marketing. 3. Get on the phone, t a l k to people. 4. Do radio, tons of radio. 5. Practice by-pass marketing, i.e. seek places for your books beyond the traditional bookstores. 6. (Almost) last but not least, write a great book! 7. Learn more to earn more. Canfield stressed the importance of being a student and accumulating knowledge (on marketing). 8. Be persistent. "Most people give up too soon." It couldn't have been a more perfect day for yesterday's Vancouver Sun Run. My sister Angelique, who has just moved to Canada a month ago, was excited to race her second 10km ever. Tim had agreed to run with her. The three of us were part of the PNG (Pacific Newspaper Group) Pacers team, since I worked as a casual copy-editor for The Vancouver Sun for about seven months in 2010. 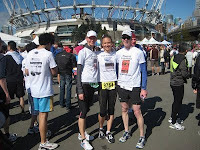 The three of us left home in Yaletown at about 8:20 ( the race started at 9) and slowly jogged to the start line. Despite the magnitude of this race, with more than 50,000 people, it was easy to get in the right spot and we were all impressed with the organization on that front. We wished each other well before Angelique and Tim went to their starting position, and I made my way to the yellow group. Women with a sub-44 10km time were seeded, so I had a yellow bib number and would start in the second group behind the blue group of elites. I got a decent spot, and now it was a matter of staying warm until the start. While I hadn't done my usual warm-up strides, I hoped to start pretty fast on that initial downhill stretch. I liked the course profile on paper, with a few undulations, and a final downhill on the last 500m or so to the finish line. As mentioned in a previous post, I was keen to go sub-41 again, and could see the potential of breaking 40mins. When the gun went, it took a bit of weaving but overall I had a superb start. My legs felt good and so was my frame of mind. With all the bands lining the course, the spectators, the energy of the other runners, and a plain gorgeous day and route to run, the kilometres seemed to fly by. I felt good. After conquering the last uphill onto the Granville Bridge, I gathered my breath and got ready for the final downhill and flat stretch. There was enough left to pick up the pace and finish strong. I made sure to cross the finish line before spending time to press my watch, which later showed 40:09. Since I am using the Sun Run to help determine my pace for my goal race, the Vancouver Marathon, in two weeks, I was diligent about taking my kilometre splits. Here they are: 3:50, 4:04, 4:07, 3:54, 4:10 (for a 5km time of 20:07), 4:00, 4:11, 3:58, and 7:52 for the final 2km. Finish time, according to my watch, 40:09. I'm stoked about that, since it's my third-fastest 10km (behind a 39:51 in the January 2008 Chilly Chase 10km and a 39:55 in a Coquitlam 10km in March 2008) and my fastest 10km in three years! It doesn't surprise me, given the times I've run in the Squamish Titans' Tuesday Runs, led by Roger Shirt. Those Tuesday Runs have been my main, and most weeks only, speed workout this year. I love doing them, and haven't missed a session of the 16-week program yet. Tomorrow is the monthly This is Not a Race 5km time-trial. On a high from the result, I made my way to a sunny spot just near the finish line so I could catch Angelique and Tim. I love the energy and vibe near a finish line of a race where everyone gives their final ounce of effort. No matter time, place, age, size, and gender, everyone gets a lift and a sense of urgency when the finish is only 100 metres away. And people run for so many reasons. Chatting with the woman next to me, I asked her who she was waiting for. A few people, she said, and especially her brother. He'd had a stroke, due to a hereditary condition, and hadn't recovered from it. Even so, he was determined to be as active as possible. She said he'd done the Granfondo last year on a tricycle (though I didn't ask if he rode the entire 120km between Vancouver and Whistler), and hoped to finish the Sun Run this year. Very inspiring. I cheered as I spotted Tim and Angelique gunning for the finish line, though, not surprisingly, they were too focused on getting there to hear or see me in the crowd. After making my way to them, I found out Angelique had smashed her 10km time by five minutes for a sub-60 finish of 59:30. Woohooo! It was an absolutely awesome event, and we had such a great time. The only downside is that my chip turned out to be mixed up with someone else's, listing my finish as 54:39. Looking at the PNG Pacers team results here, I wonder if I had the chip of the woman with a finish time of 40:07, and she may have had mine, or someone else's? We eventually found Angelique's result in the 40-44 age group (she's 37) with an official time of 59:30, a fantastic PB for her first race in Canada! For the past year or so, Tim has been working on a great manuscript about the fastest women in Ironman ever. The result is Sub Nine: History's Fastest Ironwomen which will be available later this month. Chrissie Wellington’s dominating win in South Africa last weekend marked the sixth consecutive time in which she’s finished an Iron-distance race in less than nine hours. In just a few short years, Wellington has ushered in a new era in the sport. She’s made Sub Nine performances seem commonplace—yet they are far from that. A Sub Nine performance puts a woman among the elite of the elite. Membership in this exclusive group numbers just 22; half of those have been earned in the last three seasons. The first woman to stop the clock with an ‘eight’ in front of it was Thea Sybesma of the Netherlands in 1991. After a final long run on Monday, see my previous post, I'm ready to start the taper for the Vancouver Marathon. With 19km at marathon race pace on Monday morning, I wasn't so sure how my legs would feel for the interval session on Tuesday evening. However, 36 hours of rest is a decent amount, and I've often (not always) found that legs that appeared tired from a long run can be on fire for some speed work a couple of days later. Our Squamish Titans run coach had a track session planned for us. It was a cool and dry evening, which drew at least 15 runners. After a good warm-up on trails near the track, we did a few light static and dynamic stretches as coach Roger explained the workout, aimed at sharpening. It was a ladder, in which we'd run 200m, 400m, 600m, 800m, 1000m, and the same way back down to 200m. The goal was to, if possible, dial it up for the second half. We had 1 minute rest between each one, though 2 minutes after the 800m and the 1000m. I started conservatively, and hit the first repeat on in 43 seconds. I stuck close to that pace for the following repeats until the 1000m. I went out a little harder on this one, hoping it wouldn't come back to haunt me in the final 4 repeats, and was stoked to finish in 3:35. Feeling good, and lifted by the commitment and dedication by the other runners, I was able to squeeze out faster paces for the remaining four repeats. And it felt good! On the final 200m, all runners went absolutely hell for leather, and most finished that one at least 15 seconds faster than the first one (and I have to add that most did the first 200m pretty enthusiastically). It was such a great track session, and I rested on my laurels on the following day (Wednesday). On Thursday evening, I did an easy 30mins and today I did another short session, a 10-minute warm-up, followed by six minutes of 30 seconds fast and 30 seconds easy. Saturday is rest/travel/pick up race package day. 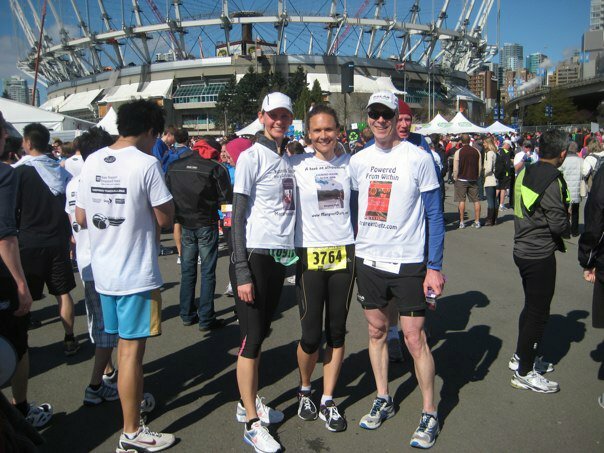 This is my first Vancouver Sun Run, as it is for Tim and my sister Angelique. We're part of the PNG Pacers team. The weather for Sunday looks good (knock wood) and I cannot wait to race with about 50,000 others! Tim and I did Sydney's City to Surf several times, the 14km run from High Park to Bondi Beach which last year drew a record 80,000. Sunday's race is followed by a 5km time trial on Tuesday, so one or both events will give me a good final indication (hopefully confirmation) of my planned Vancouver Marathon pace. I'm looking to at least break 41mins on Sunday and hopefully even make it back to sub-40, traffic allowing. "Are you still running PBs?" was a question a friend, who lives on the other side of the world, posted today on my Facebook wall. It's a great one. For me, running is not just about aiming for faster times but the desire to improve my speed (finishing times) is a key motivator in my training and racing. Aside from my debut 50-mile race I did in August 2010 and the 100km I ran in November, it's been a while since I had the thrill of a PB. In fact, it's been three years for both the 10km and the half marathon, and 2-1/2 years for the marathon distance. I ran 39:51 for the 10km in March 2008 and 88:13 for the half marathon a month later. In September 2008, I did 3:07:10 in the Victoria Marathon. What happened in 2009 and 2010, you may wonder? Well, I do too and there isn't a clear-cut answer. Having said that, one reason is that it's simply how improvement works. If I look at my 10km time, for example, by November 2007 I had yet to run sub-41 mins (my then PB of 41:18 I'd run in August 2007). But in December 2007, I ran sub-41 for the first time, followed by my first sub-40 a month later in January 2008 and another in March. I haven't run sub-40 since then. In fact, sub-41 has been a challenge. My fastest half marathon was another 88 (88:30) in the 2009 Scotiabank Half Marathon while my marathon times since my 2008 PB have been 3:10 (2x) and 3:11. Do I believe I can run faster? Absolutely! My key goal is to run a sub-3 marathon, as crazy as that may sound based on the statistics. And while I've not run sub-41 for the 10km in 2010, I'm convinced I can do a sub-39 and I'm absolutely confident that there will be a sub-88 half marathon in my future. It won't be the end of the world if those expectations turn out to be unrealistic, but for now they are a key inspiration for my training. I believe the past two years have only been a calm before the storm. How about you? Are you gunning for PBs? Do you firmly believe you can go faster? How important is that for you as motivation in your daily training? As mentioned, expectations of performance in terms of chasing PBs is only a component of running, and one that is not on the radar for everyone. Exploring your expectations is a worthwhile and exciting activity, if you haven't done so recently. Thanks for asking Karen! My original plan had been to do another 3-hour training run at an easy pace on Sunday, three weeks before the Vancouver Marathon on May 1. However, plans occasionally change. Much of my weekend was taken up by the triathlon coaching course (NCCP Community Sport Triathlon Coaching Clinic) I did in Whistler. There was no room to do a 3-hour run before driving to Whistler and saving enough energy for an intense course. I decided to postpone what would be my fifth, and final, 3-hour run before this marathon until Monday morning. The coaching course was superb and comprehensive, therefore tiring. Compounded by two late nights on Thursday and Friday because of the Vancouver International Mountain Film Festival in Squamish, and just the usual busy-ness of work (a book of an author I'm working with is nearing completion), I woke up exhausted, both mentally and physically, on Monday morning. The reality was that I did not have the time nor the (physical and mental) energy to do a 3-hour run. Given that I'd already done four of them in recent weeks, I looked through some of my books on run training for ideas. One of the key messages from the weekend's coaching course was that, within the proper training principles, there are many answers to one question. There are many ways to train/coach. It's one of the main reasons that as athletes we change coaches or training programs. Often there's nothing wrong with the coaching we are receiving but it's simply time to test something new, to stimulate our athletic body and mind in a new way. As for yesterday, I found in Joe Henderson's Marathon Training: The Proven 100-Day Program for Success a workout that suited my mood and time frame perfectly. Of course I first made sure that I checked in the proper time-frame of the training, i.e. three weeks out from race day. I also checked that I considered a workout tailored to my level of experience with marathon training. Henderson's book offers three levels: the Cruiser Program, Pacer Program and Racer Program. Since this will be my 13th marathon (not counting the five marathons I've run as part of Ironman) and I have a decade of solid and consistent training under my belt by now, I opted for the long run under the Racer Program. Henderson suggests: Long day: semi-long run of 11 to 12 miles, or half the distance of last week's long one. Run at your projected marathon pace or slightly faster. That resonated with me. After a quick check of an out-and-back course on gmap pedometer, I chose a 19km route. It took me 42:51 on the way out, and 41:08 on the way back, for an average pace of 4:25/km, and a total running time of 84 minutes. Of course I did an easy 10-minute warm-up before easing into the effort, and a cooldown after. In hindsight, it was a perfect session for me and I'm glad circumstances had me change it. Tonight it's time for interval training, the weekly Tuesday Runs organized by the Squamish Titans. On the schedules are "short intervals" on the track for "sharpening". On another rainy night, 10 Squamish Titans members gathered for the 12th week of the Tuesday Runs sessions led by the awesome Roger Shirt. Meeting point was Alice Lake. And we weren't the only local running group meeting there, with another led by Jen Segger getting ready for their intervals too. Roger had us warm up by running around the lake and explained the workout while we did some gentle stretches. He also told us the theme of the night was Positive Thinking, especially on the mile repeats we'd be doing later, and particularly when we'd hit the short but steep hill just about near the end of each mile. The session started off with a 15-minute tempo run. The goal was to run it at slightly slower than 10-minute pace. Roger ran ahead and stopped at the 1km mark to read everyone their splits so we could check to see if we were on pace. Mine was 3:59 so I was a tad fast but in the chilly and wet evening it felt OK.
To manage a group of runners at different speeds, Roger had us running one way for 7-1/2 minutes on the road near Alice Lake and then turn around to meet back at the same point. Then it was time for mile repeats. Roger, a former member of the UBC cross-country team, said after the session that it had been standard fare at UBC: a 15-minute tempo run, followed by mile repeats. He split the group in two, according to pace. In terms of effort, he said that the tempo run should have felt like a 3 out of 5 and that the mile repeats were meant to feel like 4 out of 5. While he didn't give us a time goal, he recommended we aim to go about 5 seconds faster on each one. We had the option of doing three or four repeats, and Tim, Rich and I decided to go for the latter. Our mile ran along the single-track trail that follows Alice Lake, and Roger led us out on the first one. It's a gorgeous trail though it does require paying a little more attention to footing, especially on a rainy day. Roger finished ahead, with plenty of time to take our splits. Tim was first in 6:18 and I was 2 seconds behind him. I hadn't really thought about what my time would be, and the sound of 6:20 scared me with the thought that there were three left to go. At the start of the next one, which I led, I could feel a sense of panic and had to focus my thoughts on remaining calm and positive, in keeping with the theme for the night. The combination of training load plus the challenging time goal for the next three miles could easily feel overwhelming if I allowed it to be. The first time I ever experienced this sense of panic during a run was in my first long run with a new group in the woods around Brussels, Belgium. I couldn't keep up and got worried I'd be left alone on unfamiliar trails. My sense of panic and shortness of breath followed by tears were noticed by an experienced runner ahead of me, who slowed down and told me to relax. Last night I was able to relax too, while maintaining my pace, finishing the next three mile repeats in 6:18, 6:18 and 6:21 as timed by Roger. This time it was me running hot on Tim's heels. Rich did a superb 4 repeats as well, finishing the last 9 seconds faster than his first. It was another solid interval session: only 3-1/2 weeks until the Vancouver Marathon! This Sunday I did an orientation run for the Tenderfoot Boogie, a trail race (28km, 50km or 50 miles) from Squamish to Whistler on May 14. Race director Gottfried Grosser had marked the 25km section from the Adventure Centre in Squamish to the Tenderfoot Fish Hatchery with tape, orange with black polka dots. I was one of 15 runners who showed up for this training run, which are free and open to anyone to attend. It was great to meet Gottfriend and the other 12 runners I hadn't met before. The first part of Sunday's section was flat and went along trails through Squamish. I'd run these before though never in this particular order. The trails on the second half, near Brohm Lake, were new to me and fantastic. The second half involved some uphills, and some downhills. As a relatively novice trail runner (I've been venturing onto trails regularly since May 2010), I am still struggling with doing the latter. 3. put as little weight on your feet as possible. Mitch said his experience as a rock climber came in handy. He said he assumes a rock will move when he steps on it. By taking small steps, he's able to correct himself quickly if a rock does move or his foot slips on whatever he's stepping on. He said that by picking a straight line while looking ahead, he not only saves time but also avoids overanalyzing the ground right underneath him. Zigzagging on the trail to avoid roots and rocks is a recipe for twisted ankles, he said. He recommended practicing the above, which I plan to do indeed. If you have any tips on downhill trail running, please feel free to comment. I'd love to hear them! It was a great run, so thanks very much Gottfried! If you're keen to come this Sunday for a 30km run from Brohm Lake to Brandywine falls, please check the website for details and make sure you email Gottfried to let him know you'll be coming. Just recently the West Vancouver Memorial Library hosted me as part of their Authors at the Library Partnership Program to talk about my first book, Running Shoes Are a Girl's Best Friend. The library's coordinator Sheila was very helpful and organized, while the library's Welsh Hall West has everything you could ask for. The small group of 10 that attended was diverse and inspiring. Among them was a 66-year-old woman training for the Vancouver Marathon. She's run marathons before but had taken a break for a few decades before last year completing 12 half marathons and deciding she was ready to tackle a marathon again. She's inspired her children. One of her daughters, who's also a runner, is getting ready for her first half marathon. Another daughter is starting to run while her son is an ultrarunner. "We saw an ad for your talk, and were running, a run we quickly abandoned and jumped in the car to try and get to the library on time ... I wanted to let you know how absolutely wonderful, how motivational and how inspirational your talk was. I loved it. And am about to go run on trails thinking about everything you said." "Great talk on your book Margreet! Although I'm not a runner, I was sitting there thinking I need to get started! Very inspirational. The points you made about taking it a step at a time, goals, motivation etc are all great reminders which can be applied to any areas of life and I can certainly see applying it to my painting!" Thanks so much for attending and hope to see you on the run!